I bought quite a few MAC lipsticks during my trip to New York City, and I've been absolutely loving them! 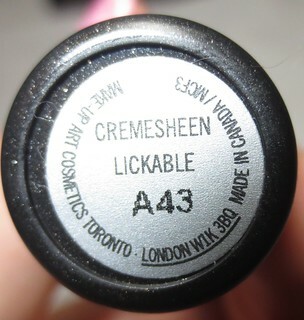 Lickable has been one of my favourite shades that I picked up during my trip, which is a beautiful fuchsia colour. I'm a huge sucker for pink lipstick, so this one is definitely right up my alley. Lickable is a fairly bright magenta shade that I think is perfect for Spring and Summer! The formula is wonderful, as this lipstick is very creamy, hydrating, yet still highly pigmented. I only have to swipe over my lips once and I'm left with fairly opaque colour. This formula does remind me of Maybelline's Vivids line. This formula wears really well, and I only feel the need to reapply every 4-5 hours. Even after the moisture from this lipstick wears off, the colour is still there, bright and bold! I really love pairing bright lip sticks with otherwise neutral makeup, and I think that a bold lip can completely make a look. Even if you don't have enough time to do a full face of makeup, a bright or bold lip makes it look like you put in a lot more time and effort than you actually did! I've been wearing MAC's Lickable on its' own, or with MAC's Pink Poodle layered over top. Have you tried MAC's Lickable before? I never really hear too many reviews on this shade! What are your favourite MAC lipstick shades? That looks like a super cute shade! Every time I go to mac, I seem to be drawn to the same color, but this looks so great I think I might have to check it out myself! Thank you for sharing! That looks stunning! Such an amazing colour for summer! !